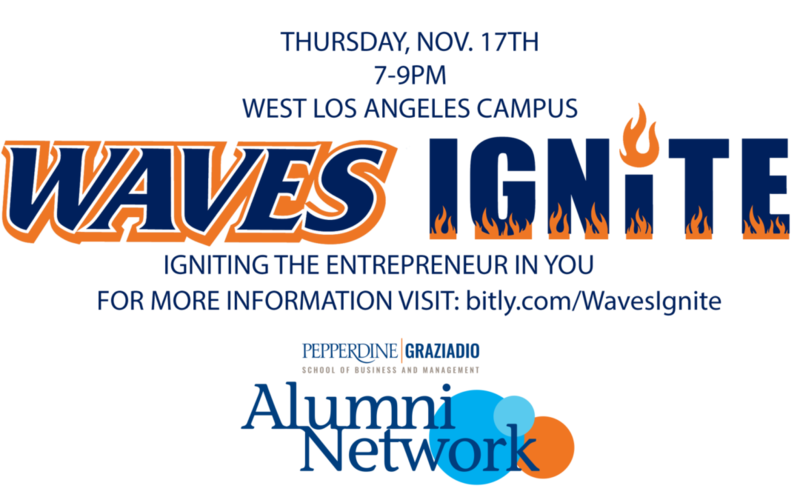 I am super excited to be leading the Graziadio Alumni WAVES IGNITE project, with our official launch at Pepperdine University’s West LA campus on Thursday, November 17th, 7-9pm. Whether you are thinking about starting a business or launching a product, struggling to grow your current company or are a seasoned entrepreneur, the Graziadio Alumni Waves Ignite Community will support you. We are launching a Graziadio Waves Ignite Community of like-minded alumni entrepreneurs with unbridled passion and commitment to helping fellow entrepreneurs build their dreams and achieve their goals. This event will consist of three facilitated roundtables of entrepreneurs that are in different stages of business: idea phase, start-up phase, and growth phase. The facilitators will be alumni experts that have had success in launching businesses. They will facilitate discussions about the trials and tribulations in each of the three phases of business and help you to solve problems and identify what your needs are as alumni. Think of Graziadio Alumni Waves Ignite Community as your own community and network of alumni friends who will support you, inspire you, and mentor you to achieve your goals. A place where forums and the greatest resources are aggregated on almost every facet of business; straight from those who have lived the entrepreneur dream themselves. Through collaboration, networking and innovation, together we will create future businesses, a plethora of jobs, and most importantly the ability to selflessly give back to our community and pass the baton to the next generation, culminating in a legacy we can all be proud of. Connection: Be part of a network with business entrepreneur experts and alumni, and create partnerships and friendships. Shawn Herrera, MBA ’14, is a Los Angeles native with a 20 year entrepreneurial background. He has a Bachelor’s in Business from USC and an MBA from Pepperdine where he is also an Adjunct Professor of Business. Shawn has founded 3 startup companies and is currently CEO of CheerForce, a youth cheerleading & gymnastics organization with 75 staff and 5 locations in California. Shawn has been married to his high school sweetheart Becky for 17 years and they have 3 sons together. After running and operating several multimillion-dollar companies for the last 20 years, managing over 500 employees and thousands of site locations across the west coast, Joe Ramirez, MBA ’11, is now a professional consultant. Over the years he has started and bought many companies in different industries. Mr. Ramirez invests in business that others don’t see as opportunities. He also provides expertise for businesses on acquisitions, strategic direction for companies, relationship building and key collaboration techniques and many other components of business. He recently became the president of Revive Productions TV and will oversee all aspects of business. Revive will concentrate on safe content for all sorts of digital platforms. Mr. Ramirez also serves as a keynote & motivational speaker to many private events and conferences. Cost: $10 A full refund will only be given if registration is canceled 48 hours prior to the event date. This event is the first of the Waves Ignite coordinated by Pepperdine’s Graziadio Alumni Network of Los Angeles. This event will provide an introduction to Waves Ignite while providing massive resources and information for the small business owner / entrepreneur.